No that would take time and some thinking. Yeah the 101 is undoubtedly a nice sound but I don’t really feel like rewarding Roland for a lack of innovation. I have very little interest in the Boutique version of the SH-101 if it doesn’t have an advanced sequencer similar to the one on the 303 boutique or the SE-02. If it were analog, it would be far more appealing. If I was looking for another little mono, my attention would definitely turn to the Malekko Manther & BBF first. IMO, having messed around with the SE-02 sequencer, I’m going to say it’s not all that. Kind of wonky. Play with one. You’ll see what I’m talking about. P-locks aren’t confined to 1 step. You have to manual adjust the step afterwards to get that 1 step effect like on the Elektrons. I’m excited for a Boutique SH101. I like the sound and the Boutique footprint is ideal for my situation of limited space. I know what you’re describing; I’m used to that way of inputting cv as well. In certain situations it’s nice. Like if you want to open the filter a bit right after the pattern starts, and have it stay at that value for the rest of the pattern; it only takes one parameter change where you want it to occur as opposed to also having to adjust the value for every step following the first parameter change. Just get Malekko or Studio Electronics to do the leg work, win-win. Roland seems to be under the impression tha boutique means tiny remakes. 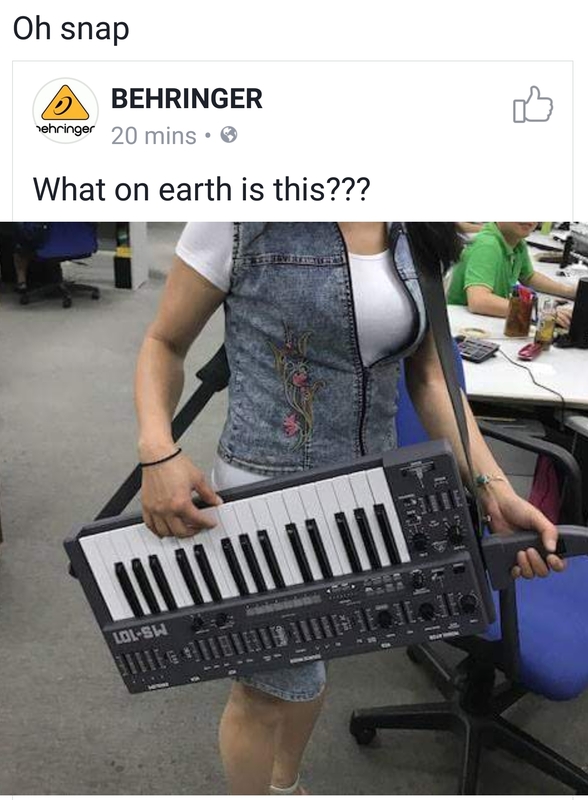 It’s too late to let them in on what a boutique instrument really means. i like the mini sh… there is always a need for that kind of sound, simple but good sounding with no effort… specially for live performances… so much stuff to choose from now, we’re spoiled a bit. Yes that’s nice but how do they justify what they are charging for these units? It’s not that they reproduced anything, they are modeled after the originals. The guts of these units are dirt cheap compared to how the original units were wired up, so there is one factor saying they are really digital but made so they behave like their analog grandfathers? Why not just make the new rehashes new, maybe modeled form factor and have their own chracter. My only complaint is marketing these things like they are revolutionary when they really haven’t done anything that nobody else hasn’t done. Even the analog clones have gotten better than the original clones. And their prices are very close to these with a great deal of care and attention put into them. No dis on the acb team for getting them right but this is a new version of something that was done 35+ years ago. Get back on track with everyone else in 2017. Simple motion secquencing, comparable ram quantities, Keybeds that are worth using. Korg has moved forward all while bringing back their legacy products. I know it’s all hit or miss but was the 909 Day release forgotten? A turntable, a two channel mixer in a tr-909 paint scene and let’s not forget the accordions and electric flute. That was a major disappointment to everyone, especially when hoping for the successor to their sp line to be announced (which they repeatedly have missed since then). I love that there is a rehash of the tb303 by Roland but subsequently there are better 303ish machines. Avalon Bassline for one. So, in the end, opinions will vary on these boutiques. But someone should get Roland in with the times. They have made some very great synths in the past and I’m sure can do it again. The market is there just not being capitalized on with new ideas. R&D out to lunch? I love the ACB concept, and the sound as well. Form factor too. I think there will be a time when it will fit on a watch sized device, which will be undoable with straight up analog circuits… And then it will be a lot easier to carry a boatload of instruments, with different capabilities while having a true to the sorce emulation of the original signal flow. I think Roland are very much at the top of the innovation game, even with the reissues. So you think this means that Behri will take on the “101 analog reissue for peanuts” challenge? Just interested to compare it to the SH-101 plug out. I have the System-1 and System-1M, but using neither in my setup at the moment. If it doesn’t improve on the plug-out then I won’t need to get one, but if it does then I’ll be interested to get one and sell off the Airas. The Boutique form factor is more and more appealing as I run out of space. Also been contemplating the Intellijel Atlantis, but would want to pair it with the Metropolis ideally, and that’s another grand right there. Bottom line is the 101 is a brilliant synth and the best emulation of it would be most welcome in my setup.